Currency Converter: U.S. dollar - approx. 67.88Argentine peso - approx. 956Australian dollar - approx. 87.64Bahamian dollar - approx. 67.88Brazilian real - approx. 244.29CFA franc - approx. 39,326CFP franc - approx. 7,154Chilean peso - approx. 45,096Chinese renminbi - approx. 439.57Colombian peso - approx. 203,724Croatian kuna - approx. 450.26Czech Republic koruna - approx. 1,621Danish krone - approx. 446.10East Caribbean dollar - approx. 182.60European Euro - approx. 59.95Fiji dollar - approx. 140.11Ghanaian cedi - approx. 259.98Guatemalan quetzal - approx. 534.34Honduran lempira - approx. 1,529Hong Kong dollar - approx. 526.46Hungarian forint - approx. 18,663Icelandic krona - approx. 8,405Indian rupee - approx. 4,510Indonesian rupiah - approx. 896,804Israeli new shekel - approx. 256.38Jamaican dollar - approx. 8,285Japanese yen - approx. 7,391Malaysian ringgit - approx. 266.60Mexican peso - approx. 1,185Moroccan dirham - approx. 656.53Myanmar kyat - approx. 79,807Neth. Antilles guilder - approx. 120.84New Zealand dollar - approx. 97.74Norwegian krone - approx. 557.63Pakistan rupee - approx. 7,113Panamanian balboa - approx. 67.88Peruvian new sol - approx. 222.20Philippine peso - approx. 3,135Polish zloty - approx. 258.44Romanian new leu - approx. 268.41Russian ruble - approx. 4,498Serbian dinar - approx. 7,378Singapore dollar - approx. 91.82South African rand - approx. 984South Korean won - approx. 77,739Sri Lanka rupee - approx. 9,859Swedish krona - approx. 551.26Swiss franc - approx. 65.42Taiwanese new dollar - approx. 2,194Thai baht - approx. 2,376Trinidad and Tobago dollar - approx. 447.94Tunisian dinar - approx. 136.48Turkish lira - approx. 193.01U.A.E. dirham - approx. 249.33U.K. pound sterling - approx. 47.56Venezuelan bolivar fuerte - approx. 678.55Vietnamese dong - approx. 1,526,140 * Exchange rates shown above are estimates only, and may vary slightly from the rates charged by PayPal or your Credit Card Company. 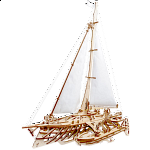 Assemble the wooden pieces to make a self-propelled boat. GEARS models are a unique combination of wood and mechanics. 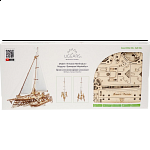 UGEARS feature easy-to-assemble wooden pieces and gears that actually move that will bring delight to novice and experienced modelers alike. 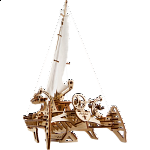 Made with laser-cut high quality plywood, there is no glue required to assemble these intricate masterpieces. Detailed step-by-step color instructions are provided in 10 languages. 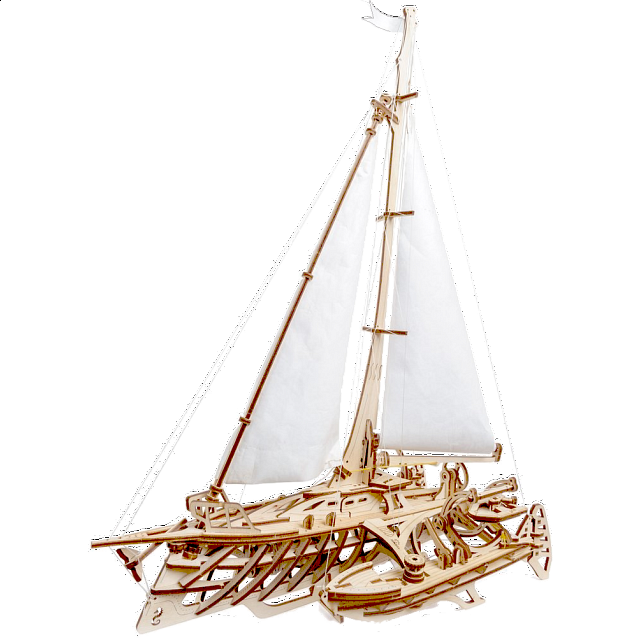 The body of the sailboat is made in the “skeleton” style to ensure good visibility of the mechanism and the design of the sailboat, including such details as bulkheads, frames and beams. The model comes with several templates for a flag of a ship. Create your own design and using the winch, hoist the ensign up the mast.